I could probably sum up this whole thing with “holy crap that’s fast”, but that wouldn’t be doing this device much justice. Quite like when we got the first 4G phones onto the market, and then the HTC Evo 4G from Sprint, Verizon’s Thunderbolt is a pretty big deal. First off, as you know, the Thunderbolt is big red’s first LTE phone. 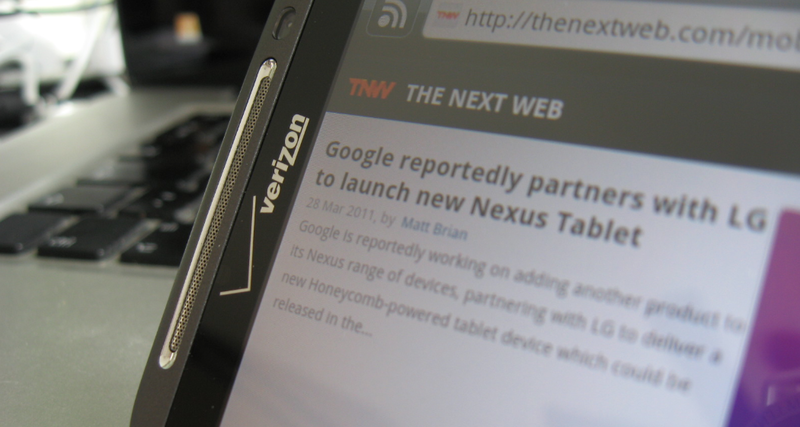 We’ve played with Verizon’s LTE USB modems and they’re exceptionally fast. But, like my first DSL connection, speed won’t matter if the device that it’s attached to can’t use it. So that takes me back to the opening statement — holy crap that’s fast. The Thunderbolt is, as has been widely noted, the fastest Android device on the market today. It’s notably faster in running identical applications than the iPhone, as well, though that won’t have much bearing on your decision of iOS versus Android. There are a couple of things that irk me a bit, right off the bat. First off, with Sprint’s 4G phones, I could choose to not have the 4G connection active if I didn’t want to. There’s no way that the LTE connection won’t cause extra battery drain, and the Thunderbolt isn’t exactly packing a huge battery at only 1400 mAh. I’m not expecting great battery life. I’m also a bit confused as to the choice to place the kickstand over the top of the speaker. It does seem to muffle the sound somewhat. Given that the speaker is one of the better ones that I’ve heard in any model thus far, it’s a shame. I’m going to give the Thunderbolt a run through its paces for the next couple of weeks. I’ll let you know my full review after that time. Until now, if you’ll pardon me, I have some massive files to download for no apparent reason other than to max out the speed.